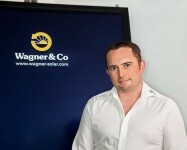 Dan Oliver - head of the solarthermal division of Wagner Solar UK Ltd.
Wagner Solar UK Ltd, the UK branch of German solar power and solar heating supplier, system integrator and manufacturer Wagner & Co Solar Technology announces plans to set up a solar thermal space heating division here in the UK. The division will be headed by Dan Oliver, who is already a veteran at Wagner Solar where he was previously a member of the PV sales team. The company will introduce the industry leading Wagner & Co flat plate thermal collector which is manufactured in Germany. The product is made using the latest precision engineering techniques to culminate in a product which minimises the energy loss and maximises the accumulated heat. Wagner Solar will offer various product options which will range from a single collector plate to a complete package including a dual coil solar cylinder. Wagner Solar UK has recently launched a solar training school to provide product and installation training for MCS registered installers. Known as the Wagner Academy, there are plans to incorporate thermal training later in the year. The company will be exhibiting at the Greenbuild Expo, the UK’s leading professional event dedicated to sustainable refurbishment and building, taking place at Manchester Central on 29-30 June. They can be found at stand C17, where a range of solar thermal and solar PV products will be on display.